Check the calendar of sessions and register HERE. Click on the plus sign to get a fuller description of the camp activities for the week. Many campers will be able to kayak at CBEC. These girls built a debris hut at summer camp. Summer camp kicks off the week of June 17, 2019, with Water, Water Everywhere, grades K-2 and 3-6. 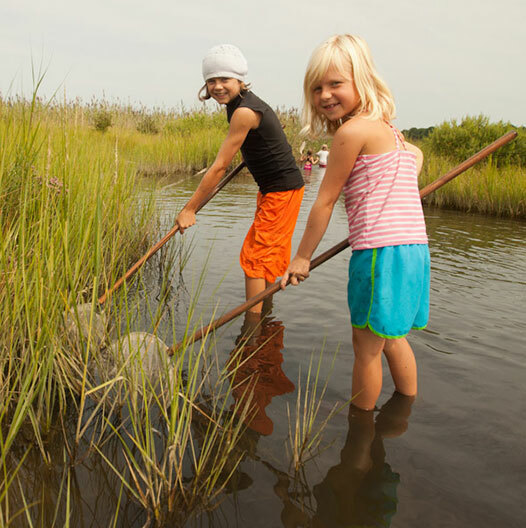 Kids will catch and investigate Chesapeake critters and learn about ways to improve water quality, and, of course, participate in water games. For the youngest children, ages 4–5, look for the Nature Tykes camps (Sessions 2A, 5A, and 7A): Habitat Hunt, Wonders of Water, and Fairy Tale Fun. 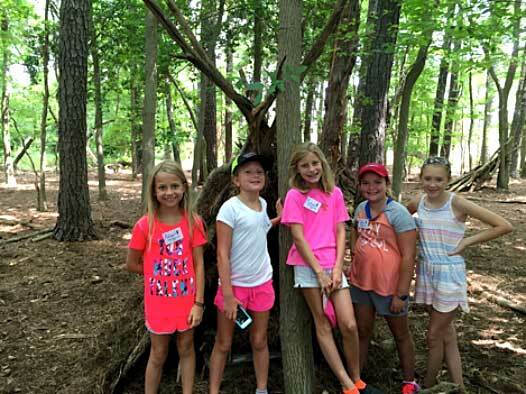 Special fun for grades K-2 and 3-6 comes with Treasure Island Camp (Session 6A/B), when campers will build a fort community in the woods, discover the history of pirates in the Chesapeake, navigate land and water, and search for treasure. Students in grades 5 through 10 can join the Chesapeake Explorers travel camp August 5 to 9, exploring the Chesapeake Bay watershed by biking, hiking, paddling, and ziplining, with a one-night outdoor overnight at CBEC. This camp has extended hours (8:30 a.m. to 5:00 p.m. Monday through Wednesday, 8:30 a.m. drop-off on Thursday for the overnight stay, and 3:30 p.m. pick up on Friday). Dipnetting leads to marsh discoveries. Campers collect and identify animals in their natural habitats. The ninth and final week of camp runs August 26 to 30 for K-2 and grades 3–6 with It’s Easy Being Green. Campers will learn to reduce their ecological footprints while enjoying CBEC’s natural recreation opportunities, gardening, and creating repurposed art. Counselors are 16 years old or older, and each year three or four education majors get an internship at CBEC to help coordinator Katey Nelson with the summer camps. Faith McCarthy, a 16-year-old sophomore at Queen Anne’s High School, spent her summers first as a camper and later as a counselor in training. Recalling some of her favorite activities, Faith said, “We’ll bring in local artists, like the beekeeper who uses beeswax in her art.” She talked of kayaking, playing outdoor games and water games, geocaching, and having a field day at the end of each week. “We like to show them Chesapeake Bay culture — livin’ the bay life,” she said. Katey Nelson is looking for energetic, responsible counselors ages 16 and over. High school students, college students, parents, grandparents and community members are all welcome. For more information about summer camps, contact Katey Nelson at knelson@bayrestoration.org.